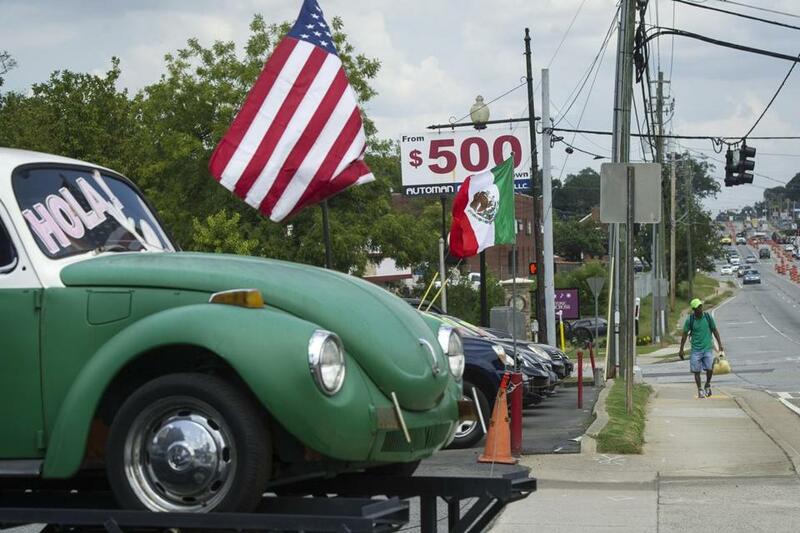 A pedestrian walked in front of a used car lot that is flying both the Mexican and American flags along Buford Highway in Norcross, Ga., late last month. NORCROSS, Ga. — One of the clearest signs of how times have changed in this little Southern town is literally a sign. It’s the outline of a faded red, oblong Dairy Queen sign that towers over Buford Highway just a few miles from the city line. It used to direct residents to a fast food franchise, a beacon of Americana, where a hamburger cost 79 cents. The building is gone now. Only the sign remains, and at its base is a Hispanic man with a machete, slicing open coconuts piled in the back of his trailer. His English is shaky. His coconuts cost $4. A generation ago, this Atlanta suburb was 95 percent white and rural with one little African-American neighborhood that was known as “colored town.’’ But after a tidal wave of Hispanic and Asian immigrants who were attracted to Norcross by cheap housing and proximity to a booming job market, white people now make up less than 20 percent of the population in Norcross and surrounding neighborhoods. It’s a shift so rapid that many of the longtime residents feel utterly disconnected from the place where they raised their children. “It’s not that much anger, but you don’t feel comfortable knowing that all this is around you,” said Billy Weathers, 79, who has lived in the area for his whole life and doesn’t speak a lick of Spanish. Many from Butler High School’s class of 1976 are now weary, worn, or furious. For some, those feelings are driving their votes. 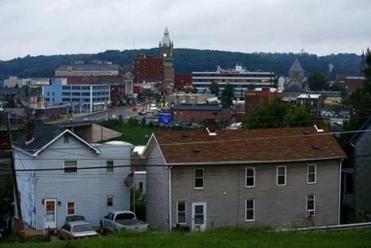 Many say they feel isolated in their own hometown, pushed to change their ways, to assimilate to the new arrivals instead of the other way around. They resent the shift, even knowing it’s nobody’s fault, really. And they have mostly kept their feelings to themselves. Who, they wonder, would listen to folks like us, anyway? But this year, in Norcross and places like it, resentment has found its voice. The concerns of a white citizenry feeling displaced have been reinforced by the rhetoric of Republican presidential nominee Donald Trump, who swept most of the state in the Republican primary. 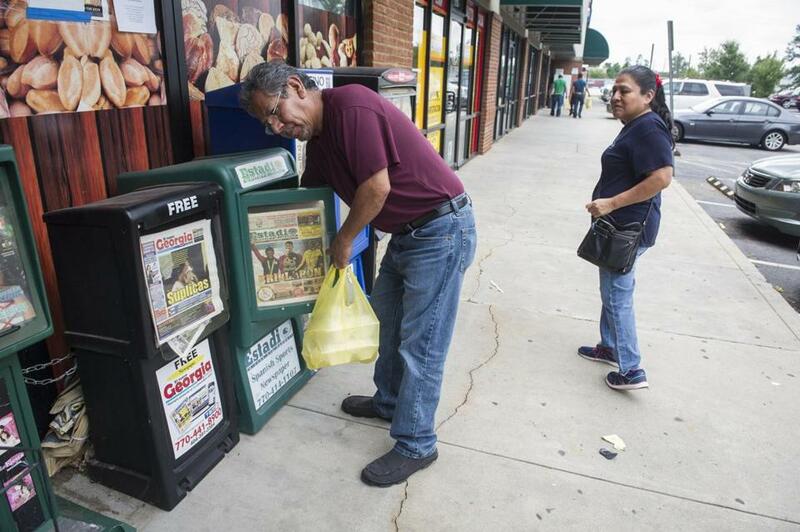 Roberto Gonzalez, of Mexico, gets a newspaper out of boxes catering to the Hispanic community as his wife Cecilia, watched late last month in Norcross, Ga.
His slogan, “Make America Great Again,” appeals to people here who don’t talk much to their newer neighbors anymore, not out of malice but because they often don’t even share a common language. When Trump talks about building a wall between the United States and Mexico, these largely white, Republicans nod in agreement. It’s an attitude that many in the elites of both parties are quick to dismiss as out-of-date, wrongheaded, and frankly kind of embarrassing. It sounds like racial prejudice, and sometimes is. But to simply ignore or belittle this sense of loss and isolation is to close your eyes and ears to nativist sentiments that predated Trump’s rise, and even if he loses, aren’t going away. The demographic tide all but guarantees it. Divided Nation: A series examining the issues that polarize the American electorate. The number of Hispanics in Georgia nearly doubled from 2000 to 2010, bringing their total to roughly 9 percent of the state’s population. That’s still a smaller proportion than in the nation, where the Hispanic population reached a record 55 million in 2014 — 17.4 percent of the country’s overall population, according to Census data. But in this part of Georgia, the pace of change has been breathtaking. Here, Hispanics are concentrated in places like Norcross, a small city outside Atlanta where a hot economy led to abundant jobs in building, hotel, and landscaping industries. Those jobs attracted job-seekers of all ethnicities. And to accommodate all this growth, Greater Atlanta needed to build. The metro area led the country in building permits issued each year from 1994 and 2005, according to data from the Atlanta Regional Commission. John Amis for the Boston Globe. 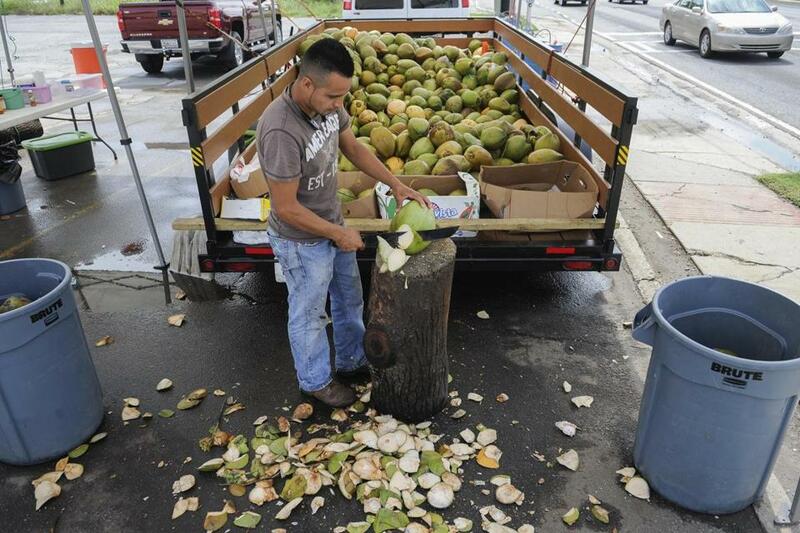 Odilon Rodriguez, of Mexico, is pictured late last month at the coconut stand at which he works alongside Buford Highway, in the vacant parking lot of a one time Dairy Queen, turned cafe, and which is now torn down. Norcross, once a sleepy bedroom community of about 3,000 people living on winding roads, attracted waves upon waves of these newcomers. Part of the attraction was the cheap housing. Part of it was the easy access to interstate highways and the jobs in Atlanta. But also, once the area had a beachhead of immigrants, more came to live near family or acquaintances, according to Mary Odem, an associate professor at Emory University who has studied the immigrant influx in Georgia. 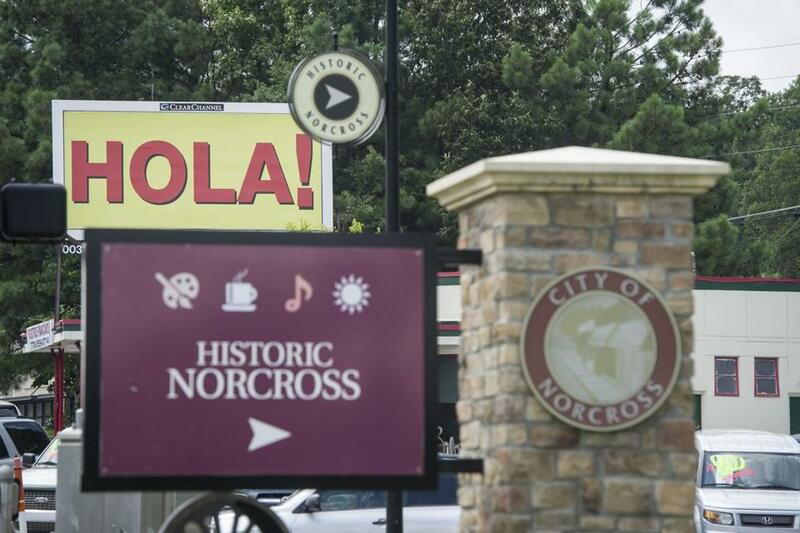 Now roughly 16,000 people live within the Norcross city limits, and about 40 percent are Hispanic. In 1980, only 23 people in the city were foreign-born. This kind of population change, if sustained throughout the Atlanta area, will vastly improve the odds of Democrats running for office in Georgia. Already it’s the reason why Hillary Clinton is roughly even with Trump in the polls here, a phenomenon that prompted her campaign to spend valuable resources running TV ads in a deep red state that has gone Democrat in a presidential election just once in the last 3½ decades. But the other side is a deep backlash to immigration, an adamant outlook that has taken hold here as in other parts of the country. Four counties in Georgia signed up for a program that allows local police and sheriffs to check the immigration status of any person charged with a crime, including Gwinnett County, where Norcross is located. Those four places deported more than 1,300 illegal immigrants using the program in the last year, according to federal statistics. The Georgia General Assembly in 2011 passed a far-reaching law aimed at making conditions inhospitable to undocumented immigrants, with provisions that barred them from using state services and made it easier for more local law enforcement to cooperate with federal immigration officials. Trump won all but four of Georgia’s 159 counties in the March Republican primary on his platform of sealing the border and deporting undocumented immigrants. His margins were high in the Norcross area, especially in the older neighborhoods that have seen an influx of immigrants. 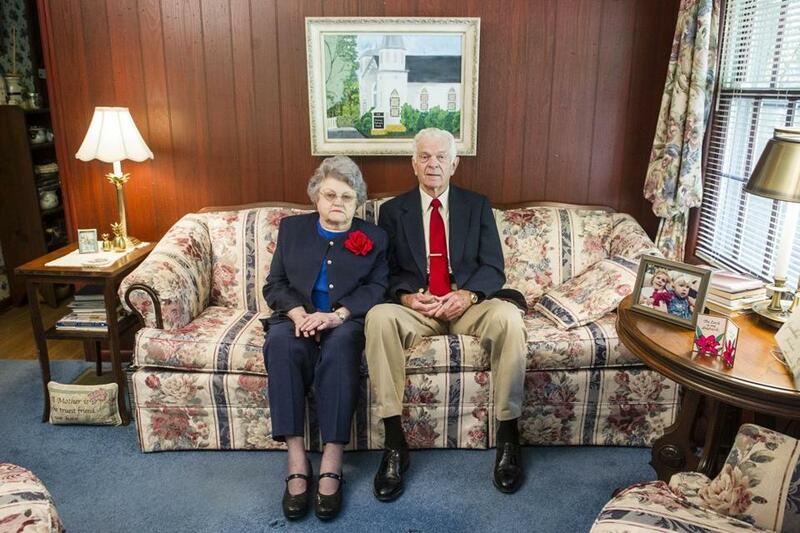 Grady (Billy) Weathers and wife Joann are pictured in their Norcross home which they built and have lived in for over 45 years. Bell, like many others interviewed, said he distinguishes between immigrants who are making an effort to fit into the existing culture and those who he thinks aren’t trying to assimilate. The Vietnamese and the Koreans, he said, are at least keeping to themselves. He listed big changes that he’s noticed: More renters in the neighborhood who seem to him to care little about the upkeep of their property, single-family houses that he says are filled with multiple families, garbage bins overflowing and litter in the streets. There are also the subtler things that get under his skin. “You can see them at the Kroger customer service center desk,” he said, saying that many of his neighbors line up there to send money home to Mexico. It’s a flow of cash leaving this little community, not building it. Norcross refers to both a compact incorporated town about 20 miles to the northeast of Atlanta and to a general swath in the southwestern portion of Gwinnett County. Old-time residents recall it as a rural outpost where upper-class Atlanta families would retreat to on summer weekends. They reminisce about when what has become Jimmy Carter Boulevard, a major thoroughfare, was just a dirt track. There’s still a historic downtown, but with a gastropub now and a specialty olive oil store. New town houses are springing up. But a sprawl of warehouses and a seemingly unsustainable number of used car lots surrounds the city center. Sixty-five percent of Norcross is zoned for business use. It’s not unusual to have a residential cul-de-sac abutting industrial land. Most of the shopping is in strip malls dominated by businesses catering to the immigrant population. Ground Game: Is the presidential election essentially over? The prevalence of Spanish signs and discourse can be a flashpoint for hostility between the longtime residents and the newer ones. Pablo Casas moved to the town in November 1999 shortly after coming to the United States from Colombia on a student visa. “I don’t know if you’re familiar with the Hispanic culture, but we’re kind of loud,” he said. When he gets together with friends, six or seven of them, the volume goes way up. And white people will complain, he said, but not about the noise. “They don’t say ‘Keep it down.’ They say ‘Speak English; this is America,’” he said. He’s worked for a few years in Norcross in an information technology business. There, he said, his boss would threaten to charge him and his colleagues 25 cents every time they spoke Spanish to each other. “I didn’t take it badly,” Casas said, adding it felt more like gentle prodding than a threat. Sometimes he feels the sting of discrimination — more when he’s working his second job overseeing a construction business that he owns. Casas, however, can empathize with some of the longtime Norcross residents. A billboard displayed the Spanish word for hello as seen along Buford Highway. Despite their burgeoning numbers, Hispanics aren’t represented in top jobs on the Board of Education or County Commission. And that’s made this area a target for Latino activists who filed a voting rights lawsuit last month alleging that district boundaries are drawn to minimize the voting power of Hispanics, blacks, and Asians. Blacks make up about 20 percent of Norcross’s population. Jose Perez tried to win office in 2010, seeking a seat that would represent Norcross on the County Commission — he lost in part because of a whispering campaign that he was an illegal immigrant. He was born in Cuba, but immigrated legally. Fighting isn’t what you want to do when you’re pushing 80 years old. The Weathers family, who live across town, are more resigned to the changes in their neighborhood and don’t feel they can do much. “Every time somebody moves, most of the time, a foreigner bought their house,” said Billy Weathers, 79. That includes a home up the street from theirs, purchased by a Hispanic family. It’s become a hub of sorts for an extended family that, to the Weathers’s taste, pays insufficient respect to property lines. From time to time they’ve seen people picking berries from their muscadine vines without permission. She doesn’t like the attitude she observes from the newcomers: “Sometimes it seems they come in demanding things instead of being grateful,” she said. Norcross changed its zoning laws to address concerns about crowding. Occupancy is limited to one person per 150 square feet of total floor space, and the county has a similar rule. But the Weathers don’t call the police or code enforcement for these kinds of infractions — they say it doesn’t seem like the right thing to do. Both supported Trump in the primary and plan to vote for him in November; their grandson Seth has done some work for the candidate in the state. The changing complexion of the area has contributed to a shift in local job requirements too. Take Deena Canfield. She’s 55 years old. Single. White. She’s lived around the area for her whole life. She moved back to Norcross from a neighboring county because it’s inexpensive and she recently lost her job. Canfield thought the largest hurdle she’d have to overcome in finding a new job was a felony conviction in the 1990s for stealing a rental car. Instead, she’s encountering a different problem. But if you’re running a business, and want to stay in business, change is necessary. That’s the attitude projected at the Howard Brothers, a grocery store turned hardware store that’s been selling to the Norcross population for 61 years. The older people know the business well, and the company likes to talk about customers it has had for three generations. “We had people who saw their dad buy a lawn mower from us,” Darnell said. Now Darnell is advertising on Spanish-speaking radio stations, and putting Spanish-speaking employees on the radio. To make these newer customers feel comfortable, they now make sure there’s a Spanish-speaking salesperson at each of their five locations. It makes sense: Some of their biggest accounts at this point are Hispanic customers. The other option is to close down. That’s what happened to the Dairy Queen on Buford Highway. It was first established in 1968 by a longtime resident who sold it in 1983 to a group that included Raish Momin. “We did a tremendous kind of business there; all Americans were living there,” recalled Momin, who came here in an earlier wave of immigration from India and became a US citizen. On some Fridays more than 400 cars would pull up to the drive-through. Then the neighborhood began changing. Koreans and Mexicans moved in. The Americans, as he called them, left. “You could not see any customers who loved the Dairy Queen,” Momin said. Momin, 56, said he cried the day he sold the business in 2004. But it proved a wise decision. The customer base continued to shrink. The new owner couldn’t keep it going and finally shuttered the restaurant. It was knocked down. Now all that’s left of the old place is the sign along Buford Highway where a new business has sprung up — a man selling coconuts for $4.